Please Note: This kit can be configured with either axial-style power supply caps, or can be converted to less expensive radial lead capacitors. Both "functional but ugly" and "professional" installation examples of radial conversion for the Intellivision are shown in our wiki. 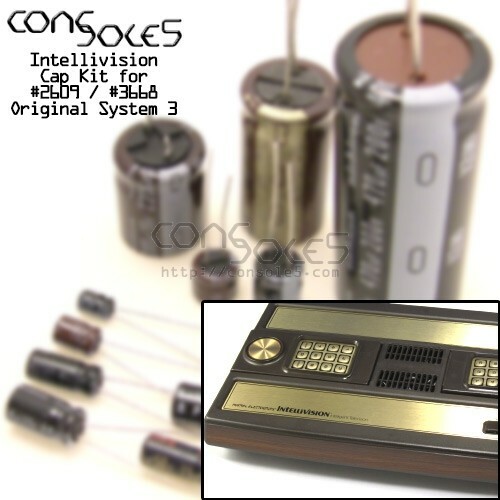 The 10uF axial caps may be up to 63v in your Intellivision, but we ship 25v or 50v parts as 63v is beyond overkill! Most Intellivisions are assembled with 10uF/25v caps. For capacitor lists and maps, please see our Intellivision wiki page. Early revision power circuits also have a resistor R2 that may be discolored from prolonged heat. These can be identified as having colored bands instead of a printed resistance value. You may wish to consider replacing with our uprated 3W flameproof resistor.